Whether you are thinking of providing your whole team with a branded pen, investing in some promotional pens to give out as marketing tools, looking for a few special pens to give as corporate gifts, or perhaps treating yourself to an executive pen – let us guide you through the options in this article. Firstly, you need to choose your pen. Below is a short guide for if you’re looking to buy in bulk – for your office, marketing, or corporate gifts. If you’re considering treating yourself to a beautiful new pen for work, think about the types of pen you usually use, the type you would get the most use out of, when you’re planning on using your new pen (at work, in meetings, at home, when travelling, etc. ), your favourite brands, your preferred materials, and which styles you prefer – modern, traditional, and so on. Have a browse through our collection for inspiration. If you’re wanting pens to give away for promotional purposes, you can’t go wrong with a classic and reliable ballpoint pen featuring your company name and logo or a current promotion. 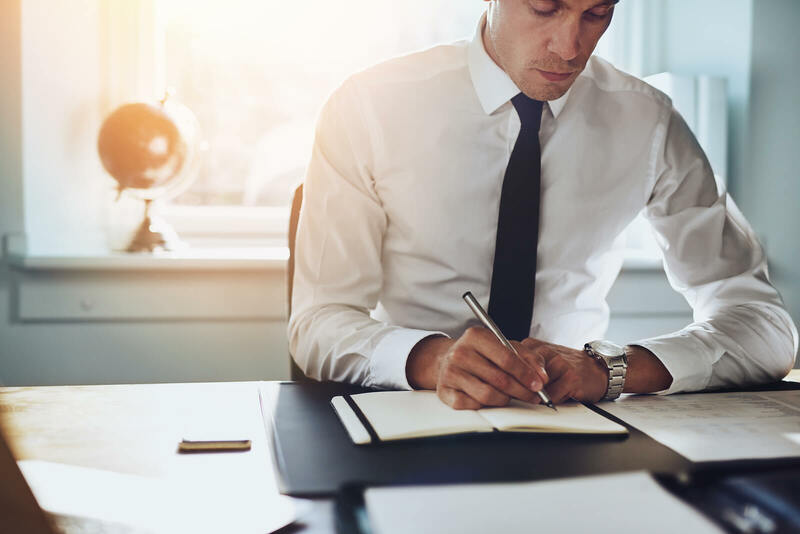 Ballpoint pens are ideal for this purpose, as everyone loves a ballpoint, and they’re the type of pen which people carry with them at all times – either in their bag or briefcase, or in a pocket. From a marketing point of view, this means your pen will be a little reminder of your company every single time the recipient sees or uses their pen. Choose a quality pen like the ballpoints in our collection, and a good experience will lead to positive mental associations with your brand. Rollerballs are essentially a combination of the best bits of both ballpoint pens and fountain pens, which results in an easy, comfortable and smooth writing experience. Rollerball pens would be a good choice for promotional products too, and are as easy to sling in a bag or pocket as ballpoints are. Some people prefer them to ballpoints for the pleasing flow of the ink, and some people prefer ballpoints as the ink dries faster than with rollerballs – so the choice is yours. Fountain pens are ideal for corporate gifts, prizes, or a special treat for yourself. On comparison to ballpoint pens and rollerball pens, fountain pens feel extra special when gifted – a writing instrument to be cherished for life. An engraved and personalised fountain pen, even more so. An excellent way to remind someone of how much you appreciate their hard work and dedication in the workplace, and a wonderful pen to gift yourself for use at work, in meetings, or anywhere you like. When gifting pens for promotional purposes, the pen you choose needs to reflect the ethos of your business – after all, it will be representing it in the hands of potential clients. 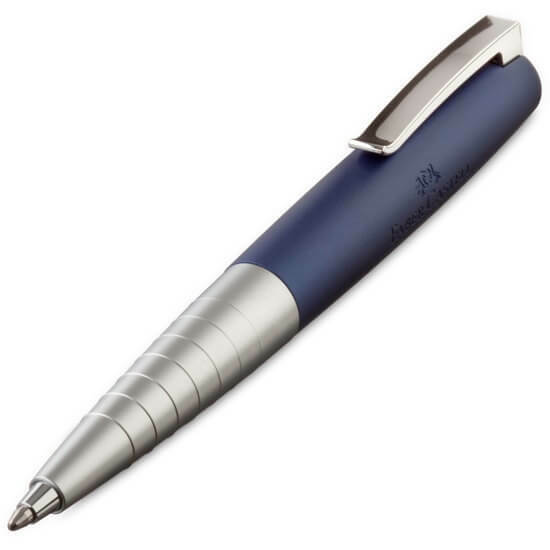 For example, a medical company would do well opting for a conventional pen shape that instills trust and uniformity (such as the Lamy Logo ballpoint pen), whereas an illustration or design business might like to express their creativity in their pen choice and opt for something contemporary and unusually shaped (such as the Faber-Castell Loom ballpoint pen – see below). If your business is tech-related, you could opt for a multifunction pen that features a stylus (such as the Lamy Screen). We offer many options for custom business pen engraving and printing. Full details of this can be found here. We can engrave pen caps, cap ends, clips, barrels, and barrel ends – we can work with you to decide which will work best on the pen you choose, or we can recommend pens based on how you would like it engraving. We have a list of fonts for you to select from, or we can recreate any font you desire to fit in with your business style. Consider your company’s logo – how large does it need to be to be legible? Which colour of pen will it show up best on? Does it need to be printed in colour, or could it be engraved? We can perfectly reproduce any logo, and help you choose the ideal pen for it too. Your choice of message is important if your pens are for promotional purposes. Instead of or alongside your logo, depending on the space available on the pen you have chosen, you can consider adding a telephone number, a website address, or a call-to-action (“Buy a Porsche car today!”) If you’re overwhelmed by all of the options, fear not – we can talk you through them, and help you reach a decision that is best for you. Faber-Castell Grip & Sheaffer VFM Prize Draw – Day 5.